For six days in July 1966, oil and ranching came together for the greatest outdoor petroleum show on earth. After its debut in 1912, the Calgary Exhibition and Stampede was promoted as a spectacular wild west show and an agricultural homage to Alberta’s early ranching traditions. The province’s reputation as the heart of cattle country shifted in 1914, however, when oil was discovered at the Dingman No. 1 Discovery Well near Turner Valley and Alberta’s other major industry was born. The province’s claim of being the country’s oil and gas capital was clinched in 1947 when, after drilling 133 dry holes in the Nisku area south of Edmonton, Imperial Oil’s Leduc No. 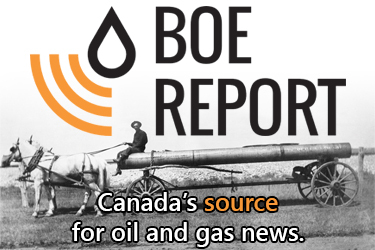 1 finally proved the existence of millions of barrels of oil trapped in the Nisku Formation. Petroleum overtook farming as Alberta’s primary industry. The province become one of the richest in the country, and turned Calgary into a major financial centre and Edmonton into a production and refining hub. The entire province enjoyed billions of dollars in new investment and a wave of immigration began by people pursuing a career in the lucrative oil and gas business. One of those new- comers to Alberta was Jim Gray. Born in Ontario, he majored in geology at UBC and landed in Calgary in 1956 to begin an historic 45-year career in oil and gas exploration. 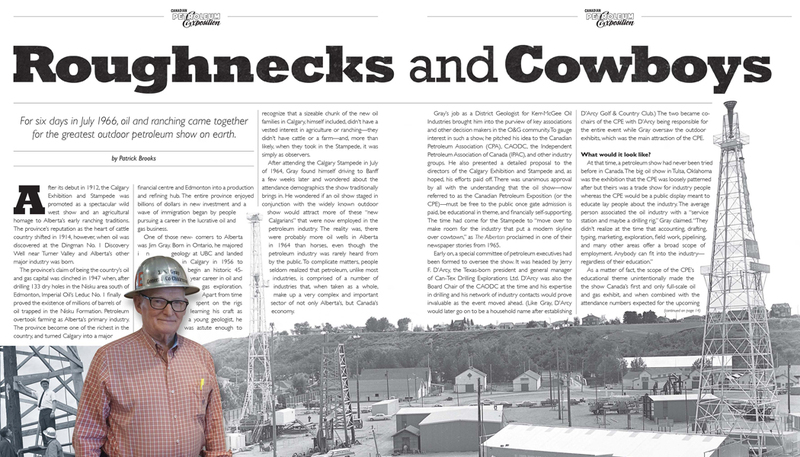 Apart from time spent on the rigs learning his craft as a young geologist, he was astute enough to recognize that a sizeable chunk of the new oil families in Calgary, himself included, didn’t have a vested interest in agriculture or ranching—they didn’t have cattle or a farm—and, more than likely, when they took in the Stampede, it was simply as observers. 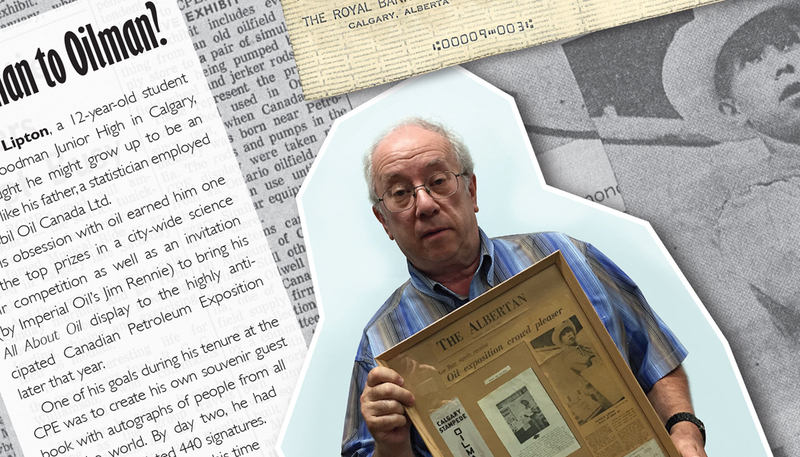 After attending the Calgary Stampede in July of 1964, Gray found himself driving to Banff a few weeks later and wondered about the attendance demographics the show traditionally brings in. He wondered if an oil show staged in conjunction with the widely known outdoor show would attract more of these “new Calgarians” that were now employed in the petroleum industry. The reality was, there were probably more oil wells in Alberta in 1964 than horses, even though the petroleum industry was rarely heard from by the public. To complicate matters, people seldom realized that petroleum, unlike most industries, is comprised of a number of industries that, when taken as a whole, make up a very complex and important sector of not only Alberta’s, but Canada’s economy. Gray’s job as a District Geologist for Kerr-McGee Oil Industries brought him into the purview of key associations and other decision makers in the O&G community. To gauge interest in such a show, he pitched his idea to the Canadian Petroleum Association (CPA), CAODC, the Independent Petroleum Association of Canada (IPAC), and other industry groups. He also presented a detailed proposal to the directors of the Calgary Exhibition and Stampede and, as hoped, his efforts paid off. There was unanimous approval by all with the understanding that the oil show—now referred to as the Canadian Petroleum Exposition (or the CPE)—must be free to the public once gate admission is paid, be educational in theme, and financially self-supporting. The time had come for the Stampede to “move over to make room for the industry that put a modern skyline over cowtown,” as The Albertan proclaimed in one of their newspaper stories from 1965. Early on, a special committee of petroleum executives had been formed to oversee the show. It was headed by Jerry F. D’Arcy, the Texas-born president and general manager of Can-Tex Drilling Explorations Ltd. D’Arcy was also the Board Chair of the CAODC at the time and his expertise in drilling and his network of industry contacts would prove invaluable as the event moved ahead. (Like Gray, D’Arcy would later go on to be a household name after establishing D’Arcy Golf & Country Club.) The two became cochairs of the CPE with D’Arcy being responsible for the entire event while Gray oversaw the outdoor exhibits, which was the main attraction of the CPE. As a matter of fact, the scope of the CPE’s educational theme unintentionally made the the show Canada’s first and only full-scale oil and gas exhibit, and when combined with the attendance numbers expected for the upcoming Stampede, it would make it the world’s largest petroleum show—as many as 600,000 would take in the CPE once they were on the Stampede Grounds. This would be a number greater than the total attendance at all 15 International Petroleum Expositions held in the United States. 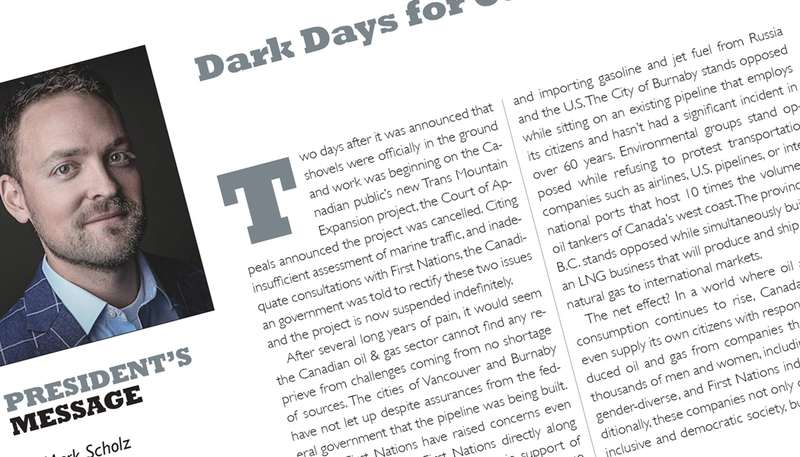 The CPE would be a public relations venture unlike any put on by any petroleum industry in any jurisdiction, and the world would learn first-hand that “Canada is not a country full of gullible backwoods fur traders,” as described by the Calgary Herald. As word got out that the CPE was in the planning stages, Jerry D’Arcy asked the media to use the term “petroleum” rather than “oil” when referring to the show. This was an early example of the educational theme of the show since “petroleum” generally refers to the total industry, whereas “oil” is typically a narrower reference limited to oil exploration and production, leaving out other important segments such as natural gas and processing. petroleum industry. All booths eventually sold although it took longer than expected. Gray himself took six months off from Kerr-McGee to work full-time on the CPE. The main attraction of the show, in his opinion, would be the drilling demonstration. Having spent many hours on working rigs, he knew that the shear spectacle of a brand-new triple rig in operation would be a guaranteed draw for curious onlookers. The scale model of the CPE exhibit (built by John Stilwell during the eight months leading up to the CPE opening), was a tremendous asset during outdoor exhibit setup. Large pieces of machinery being delivered and/or being assembled within a confined space was both an engineering challenge as well as a safety hazard. Gray and his outdoor exhibit committee pulled off what proved to be the first real test of the show’s planning. 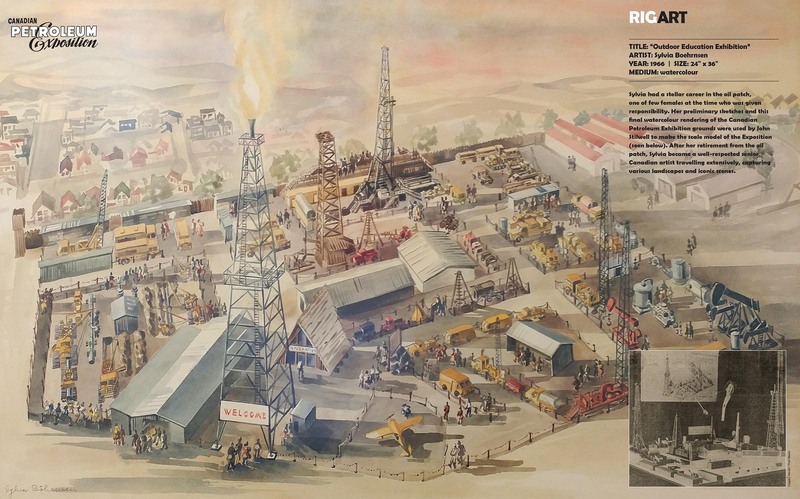 By the time they were done, the outdoor displays included: siesmic, servicing and completion, a modern drilling rig, a service rig, a replica of a old wooden derrick (Dingman Discovery Well No. 1), pumpjacks, various services (logging, steam units, testing, cementing, acidizing, drill bits, drilling fluids), a heliport, display space, a pipeline display, an historical museum, entrance exhibits, an entrance gas flare, and a natural gas display. The drilling demo itself would take place where the Saddledome currently sits. It was a Can-Tex triple derrick built by the drilling arm of US Steel Corp. [check this]. It was decided that the rig would pre-drill the hole prior to the CPE dates due to the potential hazards of spudding a well, especially in a high density urban area. For safety reasons, once the hole was drilled, the public demonstration would be a simulation. The crew ran afoul of the City’s noise bylaw a few times and these infractions were the only times the City interfered during the drilling operation. With residential houses across the street in Vic Park and across the river on Scotman’s Hill in Ramsay, noise complaints came in as the industrial activity went past 10 p.m. Gray recalls, “So at 10 o’clock every night I remember we were trying to get the hole dug and the city police would drive out, come up to the doghouse, have some coffee and delicately say, ‘Listen boys, you’ve got to shut it down.’ We knew it, and the cops were really good about it. They loved to come out there,” he laughs. The original depth of the hole was 1,500 feet and there wasn’t any question of producing anything since there were no reservoirs at that depth back (apparently there’s gas under Calgary at 9,000 feet down). It was decided later, though, that they would stop at 499 feet, just shy of the 500-foot threshold that would require an official drilling certificate. As it turned out, their commitment to drilling authenticity had Gray’s team apply to the ERCB for the “Stampede Lease” anyway and a certificate was issued for Calgary Stampede No. 1 in time for the CPE launch date. Crews for the drilling and service rig demonstrations were selected from CAODC member companies and, in keeping with a genuine operation, the crews lived on the site in two eight-man trailers (donated by ATCO) of the type common to remote locations. ATCO also supplied six portable school rooms, a well site office, and a helicopter lift office for the overall Exposition. As usual, the six-day event would begin with a parade on Monday morning. 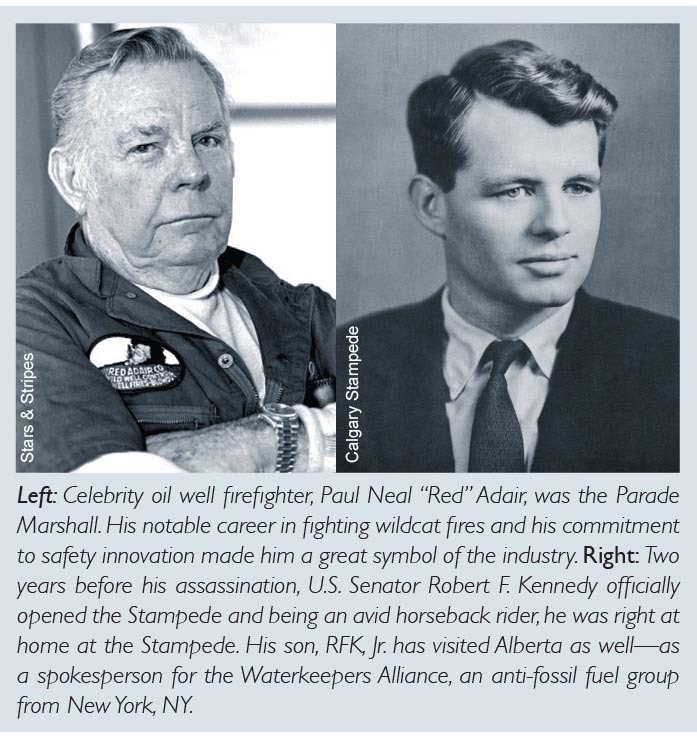 World-renowned oil well firefighter Paul Neal “Red” Adair was invited to come up from Houston to be the Parade Marshall. He was joined by US Senator Robert F. Kennedy, an active horseback rider, who was tasked with officially opening the Stampede immediately following the parade. There was an unofficial kick-off to the CPE, however, when the public was invited to the “rigging up” of the natural gas flare on Sunday night before the parade. This derrick was meant to symbolize the importance of the CPE and at a height of 170 feet from base to the tip of the flames, it was tall enough to be seen from every corner of the city. It was expected to burn five million cubic feet of gas per day and the colour of the flame could be adjusted to match any hue in the spectrum. The simulation of normal field operations put on by the drilling crews went very smoothly; continuous round trips were made every 15 minutes and, at regular intervals, the toolpusher and his gang of roughnecks changed the bits and took log readings. Drillstem tests were also conducted on a regular schedule. They tripped in and out of the hole all week for the duration of the Exposition. Be design, the educational theme of the Exposition included an historical display to underscore how advanced the equipment and technology has become. Whenever possible, heritage equipment was shown alongside its contemporary equivalent. The early acid rig, for example, was placed across the aisle from an up-to-date acid truck, while the spring pole rig (from Ontario) was positioned in a way that it contrasted with the Can-Tex triple rig, the current iteration of a rotary drilling rig being used in the drilling simulation. Big band leader Sammy Kaye played twice daily in the Corral providing entertainment for the trade show visitors and the Imperial Oil Scientists of Tomorrow exhibitors. NASA even sent up one of their Mercury lunar capsules which proved to be a surprise hit with the younger generation of Stampede goers who had a keen interest in space-age technology. The Corral also housed a display called “Ethyl” which was an early indication of how the industry needs to educate the public about the widespread adoption of products and technology derived from petroleum and petrochemical products. “Ethyl” was a female mannequin made up with modern cosmetics and she’s sitting in an automobile and surrounded by thousands of household products not normally associated with petroleum. Stampede attendance was booming, thanks to the public’s growing interest in the CPE. By the end of the six-day affair, gate receipts confirmed that that year’s numbers earned them an all-time attendance record. Jim Gray was right, there was a latent desire for the general public to learn more about Alberta’s largest economic driver. What added to the attendance numbers, though, was the urging by oil and gas companies to for their own employees take in the show to gain a broader understanding of how all segments of the industry works together in order to function properly. It was as much an educational opportunity for oil and gas folks as it was for the lay person. Ex-oilpatch workers had a chance to get re-acquainted with former colleagues when Southam Press arranged a communications centre to be set in the Corral as a service to members of the petroleum industry working at the show. Telephone, closed-circuit television, and runners were all used to contact personnel who were reached via their respective companies. By the end of the show, more than 450 old friends had been reconnected. On the Wednesday of Stampede Week, the CPE featured an oat crop being planted. It wasn’t a gag but part of the dedication to portraying a complete pipelining operation. Those in charge of the pipeline display at the CPE opted to show the restoration of farm fields after a pipelaying operation is completed, so they spread a load of topsoil over the parking lot asphalt at one end of their display area which was then seeded with oats. Exposition is a feather in his cap not easily forgotten: “We did the whole damned show for a hundred grand. Everything.” Gray, D’Arcy, and the rest of the organizing committee held true to the three mandates they set out for the show…be educational, be free, and be self-sustaining. Their vision for an oil and gas show earned them the “Best Show” amongst all exhibitions in North America that year by the International Association of Fairs and Exhibitions in Chicago. Gray admits they had some concerns along the way…”it would have been bad publicity for the industry if we couldn’t end up drilling a hole on the Stampede Grounds.” Another committee member recalls, “We are doing this job in the face of the public. One accident and it makes the entire industry look bad.” There was one mishap, though, when a female visitor got sprayed with some maintenance oil as she walked past a piece of equipment and the drycleaning bill came out of the event’s budget. The wooden replica of Dingman Discovery Well No. 1 built specifically for the CPE was relocated to Heritage Park in Calgary’s southwest where it remains to this day. The huge natural gas flare derrick erected at the main entrance was left standing for seven more years and the area was rebranded as “Flare Square” until 1973. The entire Exposition was entirely the result of generous volunteer help. With the exception of the lone female administrative assistant, no one was being remunerated for their time and skills. A $20 million show catering to 600,000 people was wholly arranged and staffed by volunteer help, most of whom held down regular 9 to 5 jobs and needed to make time for the CPE on the evenings and weekends. The success of the CPE had proven what Gray had suspected years before…there was a substantial interest in the petroleum industry by the general public. So in 1973, he and some colleagues launched the Petroleum Resources Communication Foundation (PRCF) with a mandate to get the facts about the industry into a book called Our Petroleum Challenge which was distributed across the country. “It wasn’t partisan,” says Gray, “just basic information.” The PRCF had 70,000 of the books distributed to schools and such and for a few years, managed to get a 45-minute industry presentation included in high school curriculums. 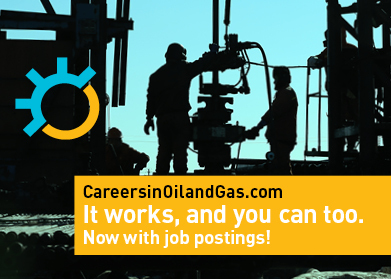 At one point, 75 oilmen were involved in delivering this message to 40,000 high school students. How times have changed. 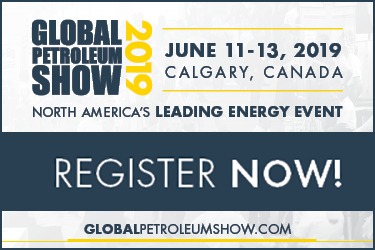 Perhaps a modern petroleum show is warranted to set the record straight on environmental concerns, the unmatched economic benefits to the country, the abundance of good-paying jobs, and the role Canada plays in ethical oil production.